On another thrilling day at this years Open it was a case of fulfilled promise as the highly anticipated meeting between white hot 5th seed Elena Dementieva and comeback queen Justine Henin lived up to the hype. True it was far from dramatic – for that you could take your pick on a third day full of five set epics – but the level of quality shown by both players was both devastating and unbelievably consistent. There are few players who can match Dementieva for current form at the moment and it showed with a typically gutsy display that now has real substance and variation. But Justine looks evergreen and back to her best which unfortunately for the Russian Tsarina, is far too good for anyone. During two close sets played over almost three hours there was zero let up in quality, alertness and concentration from the two. The respect given and deserved from the two veterans was just the icing on the cake. An angry Andy Roddick hissed and spat his way through an otherwise comfortable straight sets victory over Thomaz Bellucci after a match point was called wrong by the umpire. He now faces Feliciano Lopez after he came through past Rainer Schuettler the battle of the veterans. There were solid wins for Fernando Gonzalez, Stanislas Wawrinka, Gael Monfils and the Croatian pair of Karlovic and Ljubicic, who meet in round three. Hot tips Nadal and Murray eased through their respective matches. But the drama was supplied in full force from two 5 set epics. First, as Henin and Dementieva wowed the crowds Juan Martin Del Potro and the ever-impressive James Blake fought it out in a four hour tussle finishing 10-8 to the Argentine in the fifth. Finally 17 year old local wunderkid Bernard Tomic pushed the nu-Ivanisevic Marin Cillic all the way into the night. After a tight but – from Cillic’s point of view surely disappointing – match it was the tall Croat who came through in the early hours of the morning. A case of some comfortable wins for the seeds today as the second half of the draw (Henin aside) has followed suit with seeds meeting seeds. 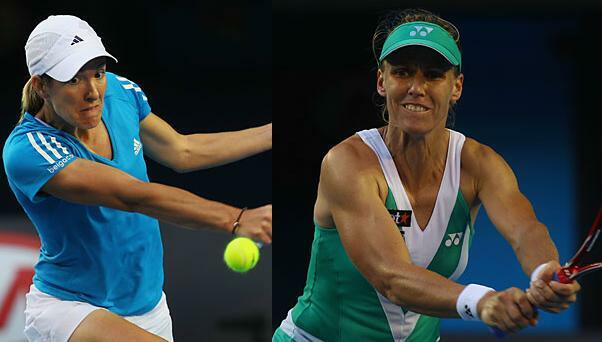 Kleybanova, Kirilenko, and Svetlana Kuznetsova all advanced for Russia and will be joined in the third round with Safina, Bartoli and Jelena Jankovic. Kim Clijsters meets Nadia Petrova after they both advanced. The main news today for the ladies is delightful for us Brits, with Elena Baltacha keeping the fairytale down under alive dumping out 30th seed Kateryna Bondarenko in straight sets. In the delayed matches from Day one there were wins for Vera Zvonareva, Na Li, Agnieska Radwanska, Caroline Wozniacki and Daniela Hantuchova…just.